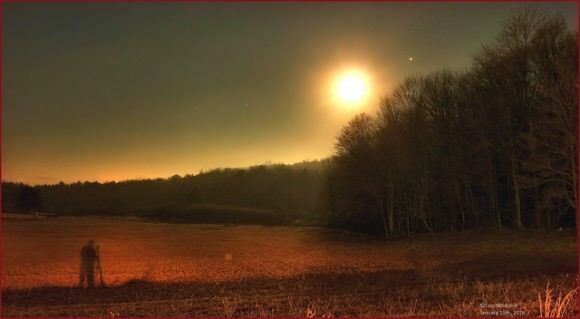 The morning’s setting Moon and Jupiter, on January 15th, 2014. Photo taken near White Haven, Pennsylvania. Credit and copyright: Tom Wildoner. So many things make this such a great photo: the conjunction, of course, but the colors, the shadow of the photographer, and the landscape all combine for a simply stunning image. Thanks to both of our photographers for sharing, and you can always see more great astrophotos at our Flickr page. If you’re looking for more conjunctions with the Moon, there are a couple coming up: On Wednesday, Jan 22, 2014 mars will be near the Moon, and on Saturday January 25, 2014 the Moon will meet up with Saturn. Find out more at In-The-Sky.org.